If you’ve been to the west coast of B.C., chances are you’ve driven on a highway running alongside the ocean fitting this exact description. While this makes for a beautiful drive, having a highway close to the ocean, like anything else, is not without complications. Take Stories Beach on Vancouver Island for example; in the fall of 2013, we completed a pilot “green shores” restoration project at the beach on Highway 19A, which is just south of Campbell River. The shoreline here was eroding and beginning to creep toward the east side of the highway. Not a good thing. Our original plan was to put riprap in along the foreshore of Stories Beach in order to protect the highway. Rip rap is normally a ‘rock star’ in erosion protection however; in certain circumstances, such as storm season, waves crash off of the hard riprap, and actually transfer the damaging effects of storms further along the beach, moving the erosion problem elsewhere. 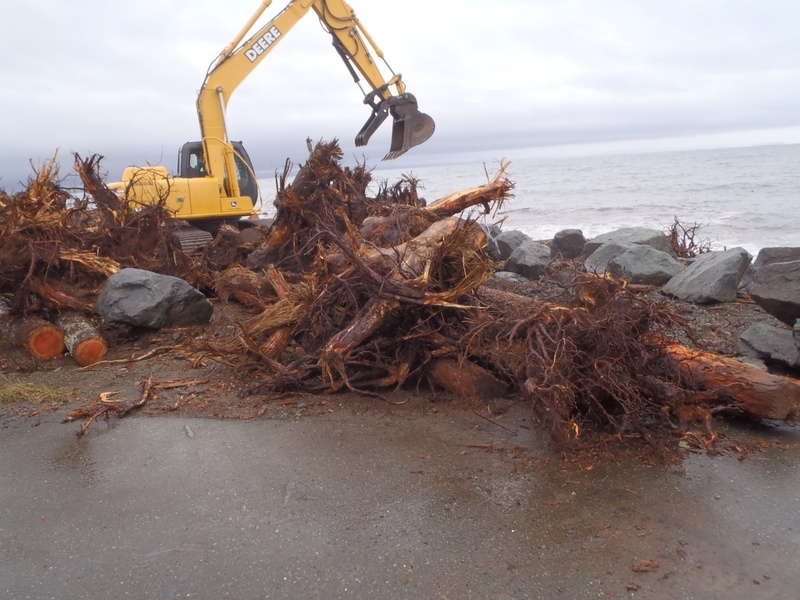 Large woody debris is put in place to stabilize the beach. With this in mind, we decided to work a little bit more with nature, and mimic the natural beachfront. So, instead of riprap, we brought in logs and stumps from forestry burn piles, and relocated nearby driftwood, to stabilize the beach. Native plants, trees and grasses were also planted throughout the area. We used large wood debris to reduce erosion by anchoring the pieces into the beach, using steel cables attached to boulders, which were buried underneath the gravel beach. Natural coastal processes cause smaller debris and gravel to collect around the anchored wood. The result is a stabilized beach, naturally. The large woody debris and natural vegetation actually help to absorb some of the impact from stormy waters, rather than reflect them, as the riprap would have done. An added bonus to this project – the “green shores” approach can be done in less time and requires less money to install. Done and done. We also erected artificial snags, which will help prevent driftwood from getting thrown onto the highway during storms, but more importantly, these snags will provide homes for nesting birds. 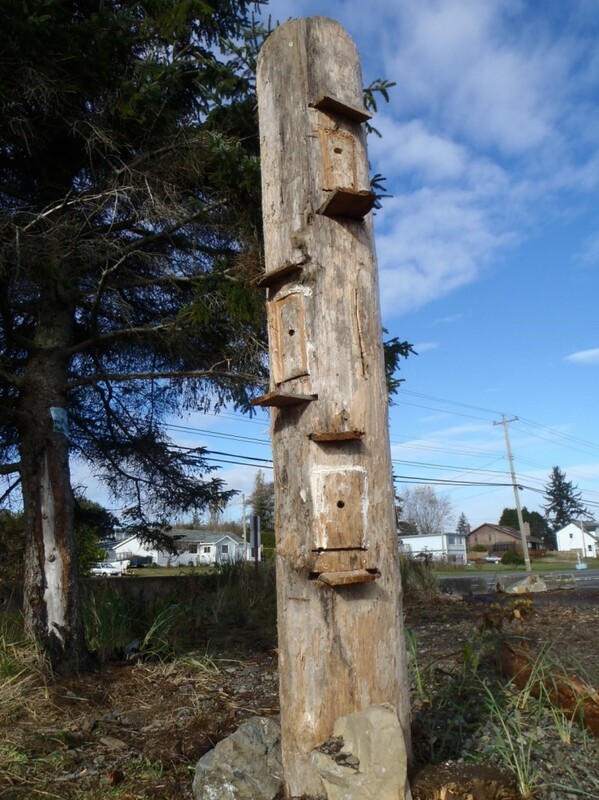 Our Environmental Management team plans to install bird houses on these snags later this year to help restore native bird populations, such as those of the Purple Martin, which had been close to extinction in the 1980s. How can we be so sure this “green shores” approach will protect the highway? Now that the 2013/2014 storm season has passed, our area office and project manager have confirmed that this pilot project was a success. With these great results, we hope to use this natural approach for more work at this site (if it is required), and other similar sites in the future. Now that you know exactly what we are doing on the beach, we have one request for you. 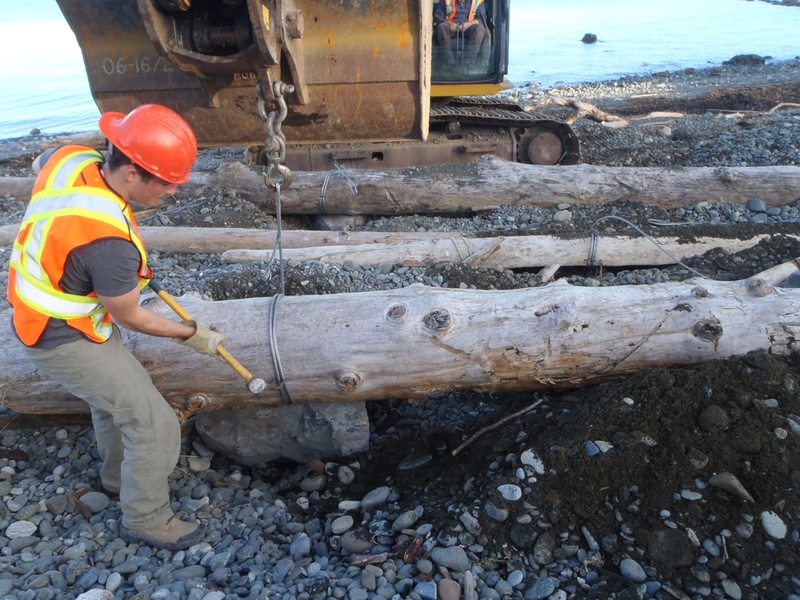 If you see our stabilization handiwork on a shore near you, please don’t disturb. Let’s work together to keep the shoreline intact for future use.